I think you mean a Junk behemoth. it would be cool to see one of these come to life. aparently there is much diference betwen the force unleashed version to each game platform...just saw several videos at youtube but couldnt get the one from the psp...in the one that I recall there is several junk behemonts and golems, but just one JUNK TITAN (thats the one Im interested in). This guy has a vulture droid head and inside of its chest is Kazdan paratus, like if it were a mecha warrior or an huge exo-squeleton. but that is the problem. was looking for it under the name of junk golem, not junk TITAN. any way...I couldnt get a convincing picture. maybe Ill improvice with the details that I remember. I think this is the one. Best pic i could find. Last edited by Darth Bobo on Mon Jun 14, 2010 11:34 pm, edited 1 time in total. Last edited by darth naes on Wed Jun 30, 2010 11:52 pm, edited 1 time in total. Nice one, darth naes, he looks vicious! I wouldn't want to meet him on a dark night! hello guys, here is my newest work. Hes a whipid bounty hunter from The force unleahsed, bespin mision. 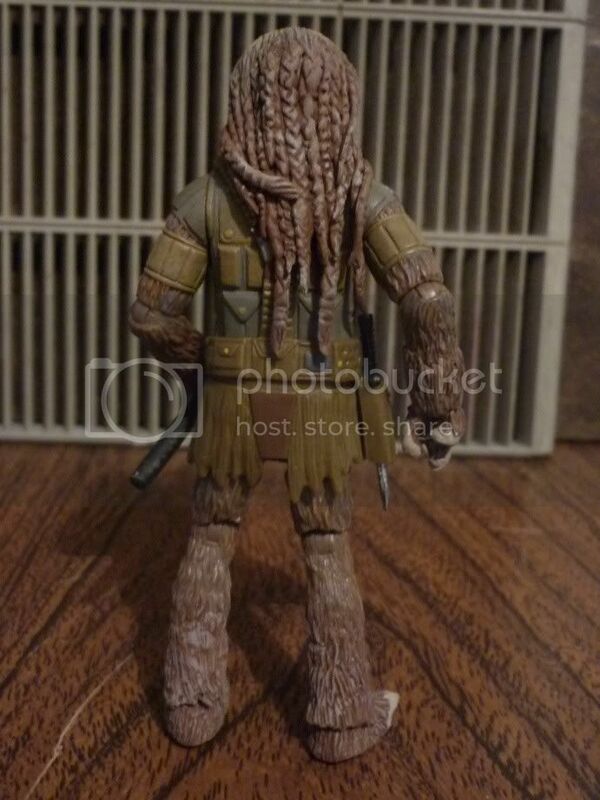 I used a conceptual Chewbacca and epoxic sculpting over the head, hands, forearms, legs and feet. also sculpted a bibro axe and placed an old Gijo hunter knife into the holster. Im not statisfied with the paint work tough... so maybe in the future will re-visit this proyect. here is a shot of alll the gang...even khrurk so you can see the size of it. this guy is huge! but i would like him to be wider, so for the next whipid Ill use a ninja turtle figure, a MU Hulk or The Thing. These two entries are awesome guys. Keep up the great work. Great job lugo!!! You did a great job on the sculpting and paint apps. Awesome stuff so far guys! I have three figures in the works, just have been swamped lately. I might have the first one done this weekend though... it's a character from The Force Unleashed as well that Hasbro has yet to make (and I kind of doubt they will). I decided to do a Force Unleashed character too, as my third entry for the challenge - I wanted an alternate version of Juno, so I decided to make one with her hair down, using the Indy lines Willie Scott head. I also wasnt a fan of how her belt looked because it made her waist appear too small, so I added a new belt with holster, from a Tie Fighter pilot figure. I think I've finally gotten all of my pieces together, so Montross should be happening this week. If I have time afterward, I'm thinking about either Senator Trell from Bounty Hunter or Drexl Roosh from TFU (Wii). darth naes: as I said in your thread before, I think you made one of the coolest dark side Secret Apprentices. Really like how he turned out. lugo_matapollos: great whipid bounty hunter. I have no idea how to sculpt such a head but your result is awesome as is your group shot of whipids. darth_sidious: nice alternate Juno. Really like the new belt as it suits her perfectly. Whole figure: TFU "Rahm Kota"
Robe parts (back): Comic pack "Anakin Skywalker"
Last edited by Darth Phantom on Wed Jun 23, 2010 12:50 pm, edited 1 time in total. 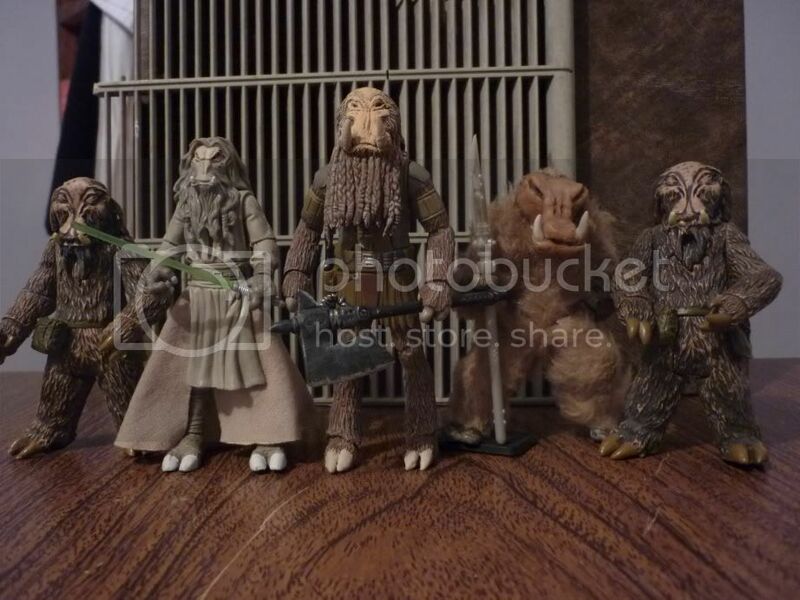 So some of you may have seen my Battlefront customs in the past, but these may inspire some more Yak entries! Only part of this figure that I changed from the reference was the type of helmet. The actual character had only the rounder helmet without the back portion or black front section, but I liked this helmet better because it had the chin strap. Not sure on the Vanguard if being true to the reference photo [url="http://customizerscookbook.com/Images/reference/HothRebel_02.jpg"]HERE[/url] was the right move. Using screen captures, I noticed that the shirts worn by the RFTs in the game were grey, not baby blue, so I went that route. They are just about SA, although a little limited due to the paint. 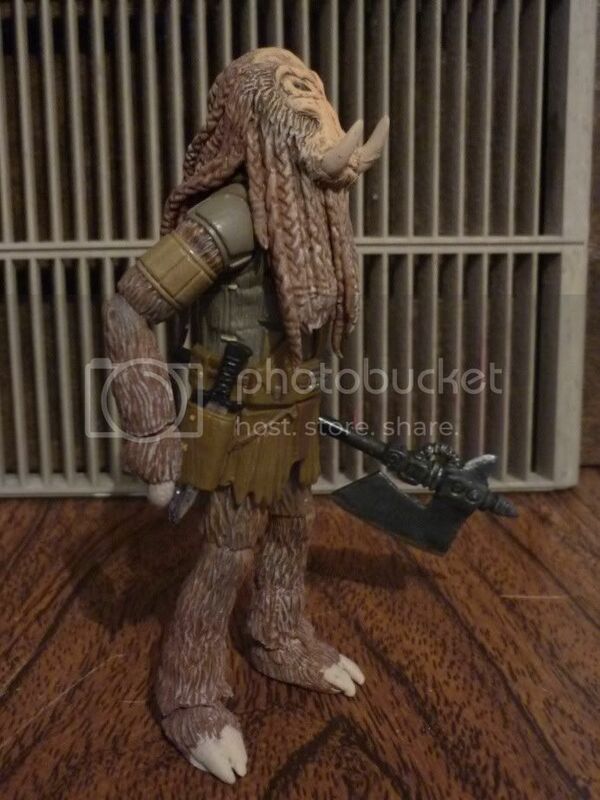 Rorworr head w/sculpey, Wookie Warrior body & bandolier, Kitbashed bowcaster. Simply a repaint with a new gun and helmet swap, this TSC figure was perfect for the trooper who carried around the rocket launcher. 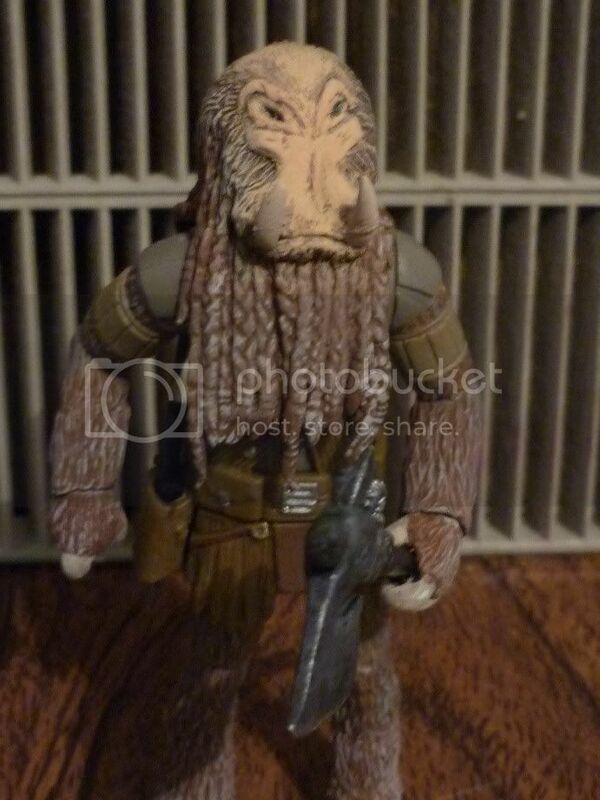 The gun is made from a Momaw Nadon Rifle and a R2-D2 Jet thing. This custom was inspired a long time ago my Corranhorn's version [url="http://www.ffurg.com/FForums/index.php?showtopic=468&hl=battlefront"]HERE[/url] . If he'd fix the link to the picture, you'd see it! 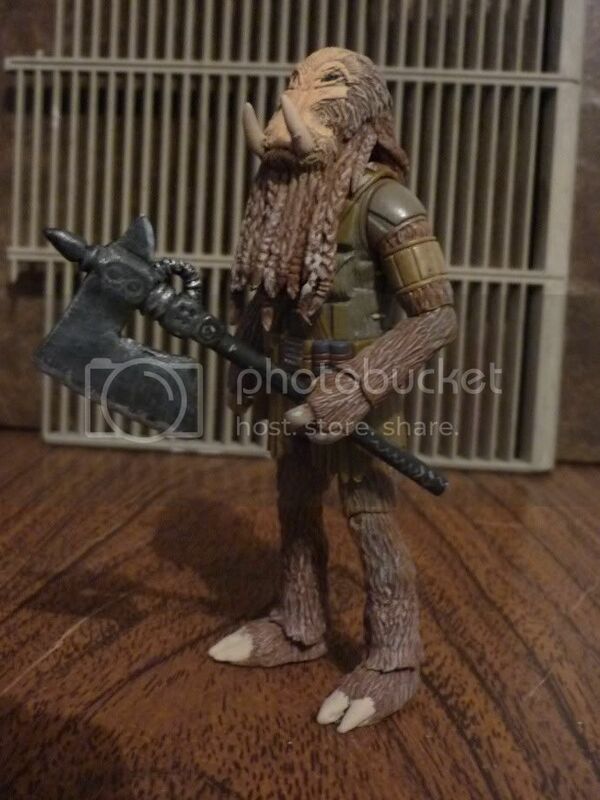 The figure used mostly an Amanda Kirby Jurassic Park 3 figure (head, torso, legs) but also used Ewok Leia Arms, a TSC Endor Soldier Helmet, a random Han Vest, a SAGA Endor Soldier Backpack, and an IG-88 rifle. This one looks simple but the Battlefront character had Hoth boots and gloves but no outer jacket. I used a Dutch Vander body, a VTSC Han belt & holster, POTF2 Luke Hoth boots, a Naboo Royal Guard head, and a POTJ Luke Pilot Helmet. The result is a slightly tall but accurate, IMO, Battlefront Pilot....next to the stormie, the most visible character in Endor and Yavin to see in the forest! Well, I've been on vacation for the last 8 days, and what a treat to come home and find such a great influx of awesome figures! Lugo, awesome Whiphid, he really is a monster, isn't he! I think you did a fantstic job on him! darth_sidious, A great representation of Juno, the head is absolutely great and the belt adds a great look! Darth Phantom, really nice update to Rahm, I'm liking the use of the molded cape, looks very cool on him! Delaton, what a selection! You've done exactly what I wish Hasbro would do, your figs would make the coolest BF Multi-Pack! thanks for the comments guys....painting is just a thing than Im not so satisfied with, Il have to get better at it. simplicity of the figure makes the accesories to jump to the eye. great figure!! !